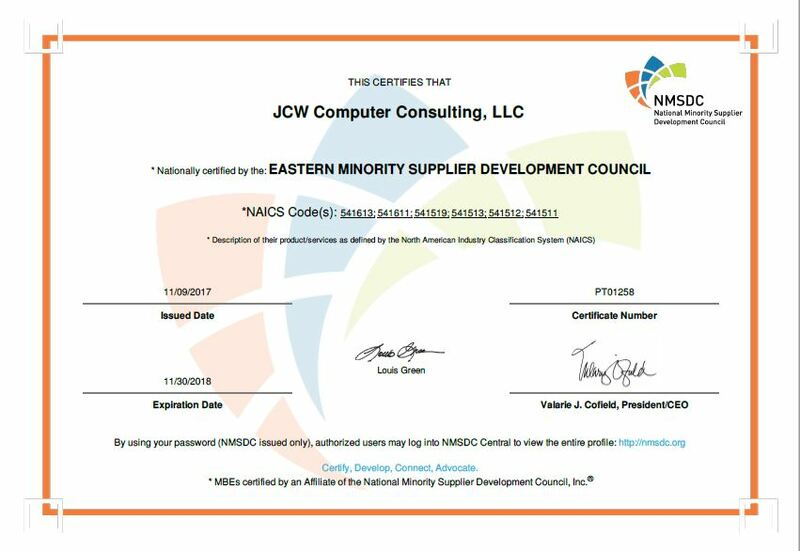 JCW Computer Consulting, LLC (www.jcwcc.com) has successfully been renewed as a Certified Minority Business Enterprise (MBE) by Eastern Minority Supplier Diversity Council (EMSDC). The EMSDC conducts an extensive business review of new and existing MBEs. This review, the Certification Process, is designed to ensure compliance with the NMSDC member standards for certified minority business status. Certification by the EMSDC is a nationally recognized NMSDC certification and is honored nationwide. For more information on certification process, please visit http://emsdc.org/minority-business-certification/.